Beauty Costs > Nails > How Much Do Acrylic Nails Cost? A common procedure done at most salons are pedicures, manicures and the application of fake nails, also known as acrylic nails. While fake nails are relatively cheap, the application process is generally the most expensive part of the job. Those who want to purchase fake nails in bulk can pay as little as $13 to $19 for a pack of 500 nails. A pack of 200 that has designs on it, such as butterflies and stars, will cost anywhere from $14 to $30 per 200. A french nail set, for example, that comes in a pack of two will vary anywhere from $10 to $15. This will be for the nails only and won’t include a professional. To do the job yourself, it probably won’t cost more than $5 to $10. For those who want to get the job done professionally at a salon will pay about $25 to as much as $55 to have a full set applied. The cost will depend on their expertise, the type of design/art, type of job, the quality of the nails and how much of the nail that has to be done. French tip acrylic nails, for example, can cost about $40 per set at a decent salon. Bestacrylicnails.com says a simple and natural job will see an average charge, but if you want a blend of colors with additional materials, the costs can be between $50 to $80. They also note that french tips, stiletto nails, solar nails and special designs can cost more. These nails will be applied to your existing nails using a primer or glue-like substance. Compared to the gel nail process, the curing time may be slower. As long as these nails are applied properly, there shouldn’t be any damage done to the nails. A salon is going to replace your old nails with the newer ones you pick out. Some salons may allow you to bring in your own nails, while others may require you purchase them in their salon. During the job, they will also file your nails down, apply them and provide any other necessary maintenance if required. A full set can be applied in less than 45 to 60 minutes. Fake nails that are purchased as a kit will come equipped with a set of nails. Depending on the brand, some kits may come with additional nails just in case one breaks. How long do acrylic nails last? About two weeks. Once your nails start to grow out, your acrylics will grow out as well, increasing the odds of damaging them. 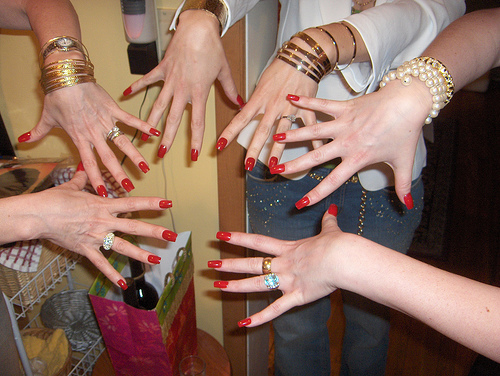 Some salons may charge to remove the old nails or even nail polish. Some salons may also require that you get a full manicure package. All salons will have its own policy. Choosing a better-branded nail at the salon can be $10 to $15 more than the basic brand they use. Extra nail lengths may see a $10 to $15 surcharge. A gel polish can cost an additional $10 to $15. According to eHow.com., for those doing the job themselves, nail polish remover, nail glue, a file and a hair dryer will be necessary to complete the job at home. Don’t forget the tip. While not necessary, most tip upwards of 30 percent. xovain.com recommends getting your fills at least once a month. Failing to do so can often lead to some nasty infections, especially if you don’t take care of them. Refills will cost about $10 to $20 per sitting. If you want to remove acrylic nails in the future at a salon, it can cost about $7 to $15. During this process, they will soak your fingernails in an acetone-based solution for about 10 minutes. Once soft enough, they will use a file to remove it. For those who don’t want to use acetone to remove their nails, other methods can be used such as using a laminated business card, dental floss or filing them down. Nail glue can be rather sticky. Be sure to be careful with it as it can stick to things and destroy items such as carpet and furniture. Fake nails can ruin the real nails below if kept on for a long time. Once your nails are applied, keep your nails as clean as possible to prevent infections. Make it a habit of washing your hands all the time. Skin contact should be avoided to potentially prevent an allergic reaction. Can you paint over acrylic nails? You’re able to paint the nail; however, in some cases, it may not show up evenly like it would on your natural nails. Because of this, your white tips may still be visible once you’re done painting. Always keep your nails as dry as possible. Wear gloves while doing the dishes and after washing your hands, be sure to dry as best as you can. Use an antibacterial soap. Since your nails can lure in unwanted bacteria, it’s best to use an antibacterial soap. If you see a chip or any problem, get it looked at as fast as you can. Doing so can often get it fixed and the salon will do it for a minimal charge if you come back fast enough. As mentioned above, go back to the salon to have your nails refilled. This will help reduce the risk of infection and keep your nails shining. Pay close attention to the cuticles. If you notice any severe dryness or redness, your skin may be reacting to the nails. To prevent dryness, try to use lotion daily. Applying nails yourself isn’t a hard task at all. Gather up a friend and apply the nails together. By doing this, it can save you $15 to $35. Head to a salon in a group, or keep your eyes peeled on deal websites, such as Groupon, where you can find discounted deals that can save you up to 50%. If you don’t care about the appearance of the nails, consider heading to a local dollar store. If applying the nails yourself, consider purchasing a complete kit that will come with the glue, nails and everything else required in order to get the job done. I paid around $25- $30. I spent 35 dollars, and 40 including tip. I haven’t gotten them filled yet but I will post again when I do.